Leave your worries on the doorstep. Sunny Side of the Street on the line, originally uploaded by Shadrach Meshach & Abednego. This poor quilt top languished in the basement for over a decade, and is finally finished! I'm calling this quilt The Sunny Side of the Street. Not only are the lyrics of that song from 1930 appropriate for the bright colours, so welcome on a drab winter's day, but the sentiment they convey are fitting for my friend, who is divorcing and beginning a new life. Can you hear the pitter pat? You know that happy tune is your step. I tried some fancy stitching on the quilting this time. Not sure I'm 100% happy with the result, but it looks fine, I guess. Also, I really wanted a red binding for this quilt, but on reflection, I'm afraid the one I used was too dark or too intense. I would have liked one that was a bit more orangey, but I went ahead and used what was in my stash because I was in a hurry. But it looks okay, I think. Argh. Aren't we all our own toughest critics? I'll be rich as Rockefeller. I'm very, very happy to be able to give a friend a gift that will provide her a bit of comfort in her days of difficulty. It's hard to see a friend hurting. When you can't do anything else, give a quilt! And now I can move another one off the list of WIPs. I don't have very many on that list (see sidebar) - only three now, and one is already a flimsy. Yay for me - at least in this area of my life, I appear to be a finisher! With my blues on parade. This rover has crossed over. 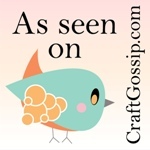 Updated to link to Amy's Sew-N-Tell Friday! Go look at all the goodies! beautiful and it does brighten up a dull day. This quilt is very pretty. While the individual blocks don't blow me away, the pattern they create is striking. And Lesly, your red binding appears to match the intense red/pink in the flowers in the smaller squares and really brings them out. if I just pretend I'm iin distress, can I get as lovely, cheery, happy, beautiful and thoughtful a quilt? just teasing. you're an awesome friend for thinking of her this way. I hope it helps! Very pretty quilt. In the pics the red binding looks good. I think it picks up the same color in the print. What a lovely gift for you friend. And I agree with Suzanna, the binding really does bring out those flowers, I think it is a perfect compliment. Gorgeous Lesly. I really like the binding. That is fantastic advice, "when you can't do anything else, give a quilt". The quiltback fabric is so gorgeous. Beautiful quilt. Your quilt is beautiful! I like the red binding. Such a nice gift for your friend. She can wrap up in the quilt and feel it hug her at this rough time in her life. Hopefully, there will be better times in her future? this is so fun and pretty and a perfect gift for someone starting over. i love the backing fabric. 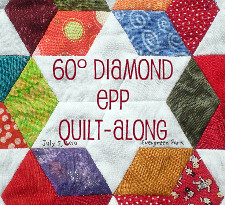 Wonderful quilt, and I love the name. May your friend find her new life on the sunny side of the street. It's beautiful, Lesly! Why do we 'pick, pick, pick'? I think the bright, bold red binding really draws out the blooms in your other print, I love it! p.s. I see less snow in the yard, too, is it a sign of better weather-? It's very pretty, Lesly. I love the backing fabric. I used that same print in my never to be finished snowball quilt. I'm sure your friend will love it!!! You are right...so bright and cheery....great name you came up with for the quilt. 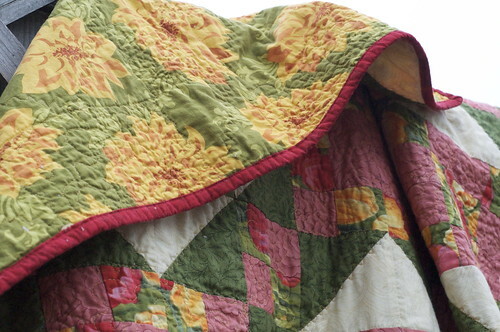 I think of quilts as hugs so this is what your friend needs right now. You did a wonderful job with this quilt. I'm posting another comment ... you know, official Sew & Tell Friday comment ;-) I can't believe this quilt top languished in your basement for a decade!!! I'm so glad it is seeing the light of day now and helping out a friend in need. Have a great weekend. I'm so glad this quilt is seeing the light of day, it's lovely! I'm sure your friend would cherish anything, what a wonderful gesture, but this quilt will be easy to love, it's just so cheerful. I think the binding looks great, but you know me and red! I have one little one inch block on the top I'm working on now that is driving me crazy. It would be tough but not impossible to replace but I'm going to try to live with it, "good is good enough"...I just keep saying that, but so far I'm not believing it. Yes, we are our strongest critics. New follower from sew and tell.That is beautiful! How sweet of you to give your friend this beautiful quilt. I love the colors and the red binding is perfect. Your friend will cherish this quilt. It is so cheerful and pretty! I love it! And that Sandi Henderson on the back is one of my favorite prints! Great job and so nice of you to give to a friend in need. What a wonderful gift! I agree with the remarks here on the binding, from the pictures it looks perfect and brings out the dark in the blocks. And the backing is such a pop! It matches so well! What a pretty quilt! What a wonderful friend you are. I'm sure glad this quilt was able to come out of hiding!! that red binding is perfect in my opinion!! A beautiful quilt, a beautiful gift, and a beautiful heart--yours! Oh wow Lesly, I love it! Beautifully done. Love the name you chose for this quilt it really suits it - so kind of you to give this beautiful quilt to your friend. Such a bright and cheery quilt. Love the fabrics and I think you've done a great job with it all. A lovely gift for your friend in need and very aptly named! 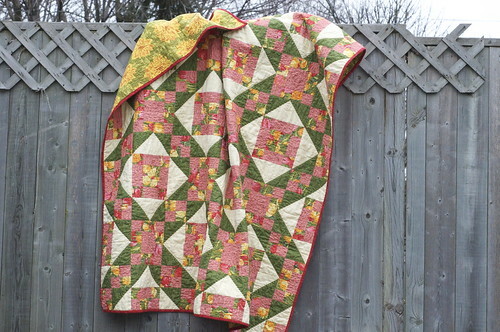 I could use a sunny quilt, so tired of all this rain! Such bright and happy colors. Your quilt is beautiful! I love it! I am glad you finished it. I like those borders that frame a quilt. It picks up the pink beautifully. A very sweet gift for a friend. It has a wonderful fresh spring feeling. You have done a great job. It looks wonderful especially for 10 years old. I think it will be a wonderful gift. I often refer to my quilts as hugs while you are sleeping. My son likes this concept. I hope your friend gets great comfort from your gift. And yes we are our own harshest critics. Beautiful! What a thoughtful gift! Your friend will love it. The quilt is beautiful. Wtg on the UFO finish! And I personally love the dark red binding. I'm sure your friend will find much comfort in this gift! I love it! I'm with Suzanna and wasn't too sure I loved the colors, until I saw the whole thing, then LOVED it! No wonder I'm usually horrible at choosing colors :) Love the backing too! Wonderful job. You know, I like the binding--not so matchy-matchy. This will be a good thing for both you (finished WIP) and your friend! Glad to see your quilt finished. I think the binding goes well with the colours in the quilt. Your friend is so lucky to have it and a good friend like you to support her at her time of need. Following from the Sew N Tell! 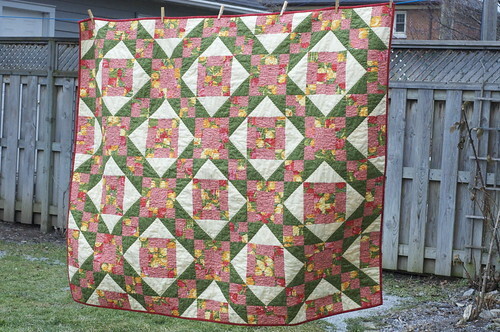 Love the florals in this quilt. Great colors. 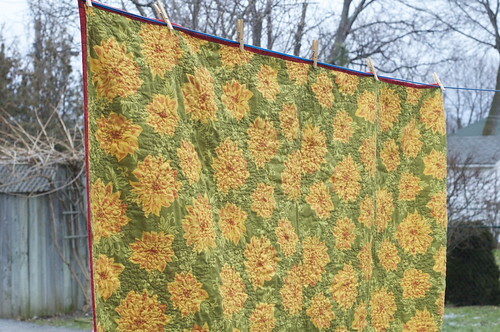 The backing is so pretty it could be a reversible quilt. Love the Farmers Market on the back! One of my very favorite lines ever. Beautiful work. Just found your blog today....taking time to look at all your beautiful quilts. Have my own fabric stash, just haven't been sewing or quilting much. 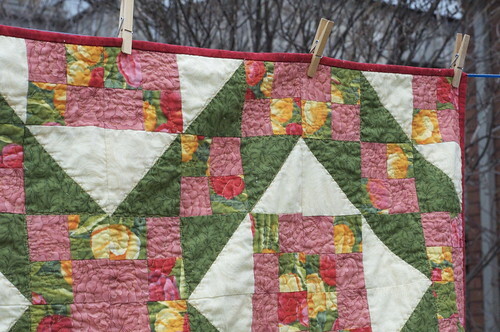 Life happens, and other needs take over the "I used to love quilting mood." The binding on Leave Your Worries is perfect. Thanks for sharing your completed projects.